there’s a girl baking at midnight on the monday of memorial day weekend. midnight is whatever- she’s a college student. this is early. the real problem is the volume and frequency of baking: she made a souffle the day before, and a cake and muffins two days before that. please send help. she felt like baking after she found out that she wouldn’t have to take the 8:30am vietnamese bus that leaves from a sketchy part of a neighboring town back to school, and that the driver who originally bailed on her actually could take her at the much more reasonable time of 2:30pm. her grades cringed, knowing that they would suffer from less studying, but the girl couldn’t find it in her willpower to study or go back early. her mom suggested she make granola bars for her brother, since said mother has been wanting to make them for months but is much too lazy. i used up the rest of the coconut oil in a jar i found in the pantry, and filled the remainder with canola oil rather than use butter. i measured out the honey in the same cup, which was uber helpful in getting the honey out later. molasses and white sugar mixed to make brown sugar because the commercially made kind wasn’t available in the house. but it’s adaptable- if you’re vegan, use maple syrup instead of honey. gluten free? use almond meal. increased salt and cinnamon to 1/2 tsp each because why not. 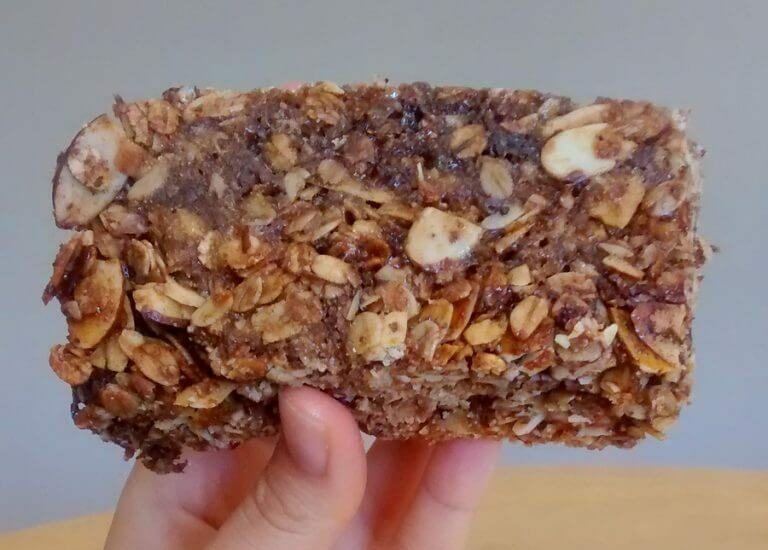 i toasted the oats and almonds while oven preheated because more toasting is always better (until you get burnt things, but i said toasting not burning/charring/etc). two cups of sliced almonds instead of almonds and pecans and walnuts and dried apricots because my brother is boring and restricts my baking. i used wheat germ instead of flour, though i think nut meal would be another interesting option. all this dumped into the pot with the wet ingredients, then i tried to mix it well but there was a layer of molasses on the bottom. whatever, good enough. packed firmly into a parchment lined 8×8″ baking pan. they got super caramelized and dark on top by the 25 minute mark so i pulled them. the next day, i pulled them out and cut them. didn’t grease it but the bars didn’t sticky (hooray!!). 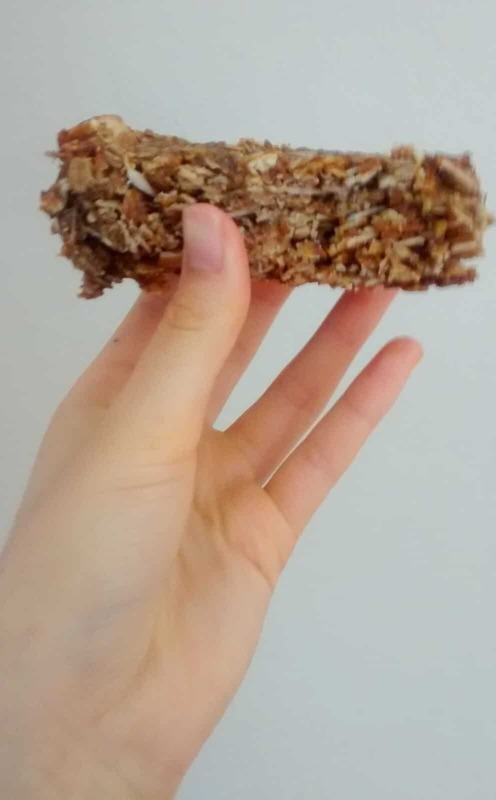 the bars didn’t cut smoothly and were more crumbly than i wanted- perhaps cut down on the mix-ins or add more liquid or pack it down even more if you want something that sticks together better. this is definitely a chewy, not a crunchy, bar; i like both so this was nbd to me. they did taste a touch sweet for my taste; mom suggested upping the oils and decreasing the sugars, although i would be a touch hesitant because oil doesn’t have the stickiness of sugar. 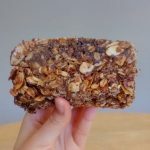 Laura Vitale's granola bars are the perfect on the go breakfast (especially if you want granola, but don't have time to sit down for a bowl!). In a small saucepan over medium heat, bring the butter, honey and sugar to a boil. Remove from heat. Add the vanilla. Add everything else and stir well. Pour into a parchment lined 8x8 pan. Pack down firmly. Bake at 350F for about 25 to 30 minutes. Cool completely before cutting into bars. Adapted from Laura in the Kitchen. There is no shame in baking at 12AM. I've definitely done it too in college hehe. baking at night is just so nice, esp during summer when everyone else in the house is ready to knock me out if i turn the oven on during the day. yes!! i waste way too much time watching food vids on youtube.